You could argue that we’re in a golden age of hot hatches right now. The spread is wide and the going is good, with few genuine duffers. 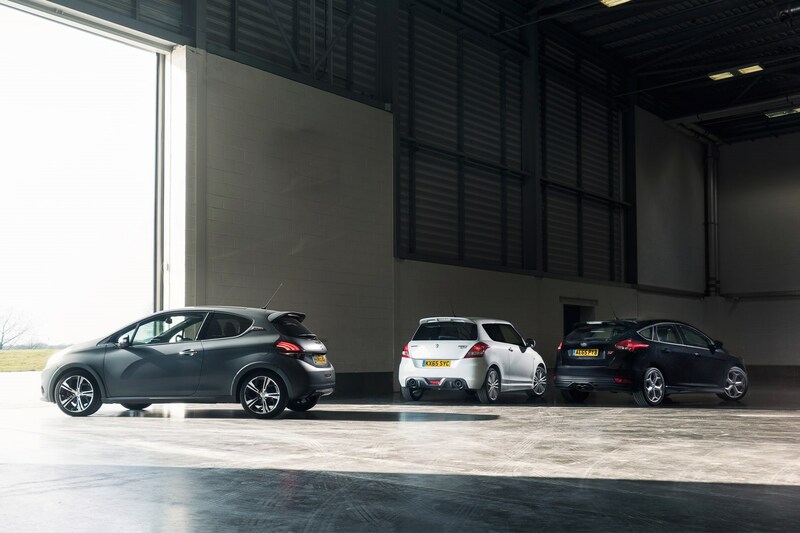 Take this trio, of Suzuki Swift Sport, Peugeot 208 GTi and Ford Focus ST; with power outputs ranging from around 134bhp to 247bhp and pricing from £4k, there’s something here for everybody. Suzuki Swift Sport (2006-on) – from £4k! The Swift Sport is more korma than jalfrezi but it’s got personality to burn and one of those rarest of commodities in 2016: a rev-hungry naturally-aspirated petrol engine. That £4k price will only buy you a previous generation, 2006-2012 example (in fact, you can get one for half that, if you’re prepared to gamble on it having been thrashed) but since the formula and the foundations are largely the same, both this and the car from 2012 hit the same sweet spot. Few cars deliver so fully on their potential, let alone from a position of such modesty. Wind one of these up and you’ll have a grin a mile wide. Significant differences between the two generations are the extra 50mm in the Mk2 Sport’s wheelbase, helping refine the chassis, the addition of a sixth gear ratio for less frenetic cruising, and an uprated 1.6-litre four-pot that swells power from 123bhp to 134bhp. You get fewer trim rattles in the newer car, too, though that might just be age related. As such, the Mk1 is rawer, firmer, less good at long journeys; the Mk2 more grown up but a smidge less sharp. Both require strict adherence to the servicing regime, which includes shorter intervals than you might expect; gearboxes can be troublesome if abused. Peugeot 208 GTi (2013-on) – from £10k! If there’s a sign that Peugeot has finally turned a corner it’s the 208 GTi. Right from launch in 2013, it was clear the magic was back – if not quite so much of the lift-off oversteer. For while the Pug’s 197bhp 1.6-litre turbo out-muscles the Fiesta ST’s 180bhp equivalent on paper, it’s no disservice to say the chassis has been set-up with less of an edge than the Ford’s, especially since the greater compliance that comes along with this makes the Peugeot much easier to live with day-to-day. That’s also not to say it’s too much of a softy – stacks of grip and 203lb ft of torque at just 1700rpm makes short work of any road. And at under £10k for a 20,000-mile example, the Pug is a bargain. And if you can find 50% more you’ll even bag a limited run 30th Edition, with more power (205bhp), Brembo brakes and track-ready handling. This spec was incorporated into the standard model range as the 208 GTi by Peugeot Sport after the 2015 facelift. Ford Focus ST (2012-on) – save £11k! Looking for something a little more, er, challenging? Look no further than a lightly-used Ford Focus ST. The first time you light up the Mk3 Focus ST’s front wheels out of a roundabout and the steering wheel starts writhing in your hands like a python having a panic attack, you’ll find yourself wishing you hadn’t skimped on the arm curls at the gym. This fast Ford can be a handful, make no mistake, but the brutish way it shoves 247bhp through its front tyres is very much part of the charm (though perhaps ‘charm’ won’t be the word you’ll use when you find yourself at Kwikfit. Again). And while it hasn’t quite the all-round class and capability of the Golf GTI, it’s more powerful (Ford’s quoted figure is decidedly conservative in our humble opinion) and exceptional value for money: prices for pre-facelift cars start at under £12k.